Art of the versus arena entrance screen. 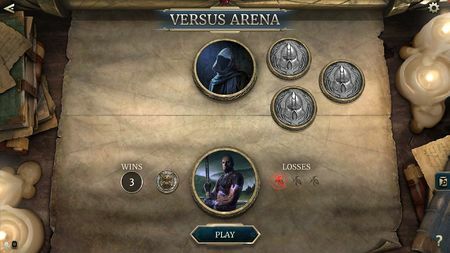 Versus Arena is an arena mode in The Elder Scrolls: Legends. Versus Arena consists of several consecutive matches against other players. Rather than using one of your already-constructed decks, you choose one of three offered classes to play as. You will then be given a choice between three cards with the same rarity within that class. 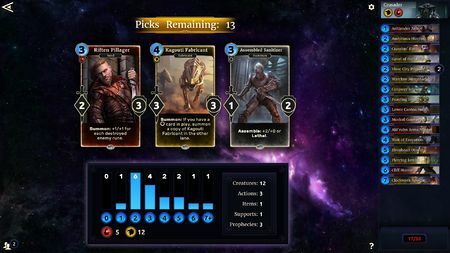 After you pick one, you get to choose between three new cards until you reached a deck limit of 30 cards. This deck will last through the remainder of the arena. In Versus Arena, you face off against other players. The mode is over when you win seven matches, or when you lose three times. When you enter the Arena, you will be faced with an avatar featuring a hooded figure. Every time you win a match, an image of a coin is placed randomly on either side of the hooded figure's token (three coins eventually appear on both sides), and another win is added to your win counter. The hooded figure turns into a coin with your seventh win. Every time you lose, a red glowing rune is placed on the right of your token. Versus Arena only uses the standard Lanes. For special types of lanes, there's a Versus Arena mode called Chaos Arena, which appears every month for a limited time. As with the Solo and Chaos Arena, every time you earn a rank, you earn a promotion reward of fifty gold. You earn a rank every time you defeat seven opponents. 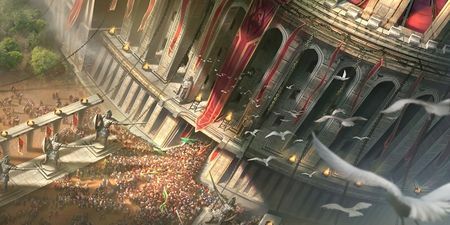 Versus Arena shares its ranking system with Chaos Arena, but is independent from Solo Arena, though the progression and naming scheme are identical. The following is a list of quotes from the Arena Announcer in the Versus Arena. He is voiced by Wes Johnson, the same voice actor as its Oblivion counterpart. Welcome! Welcome to the Arena good citizens of the Empire! Welcome to the Arena where we promise vicious combat... and refreshments. Welcome back to the Imperial Arena. Let the games begin! Presenting the Archer. Dead from a distance. Presenting the Assassin. Hidden, until it is too late. Presenting the Battlemage! Ready with spell and blade. Presenting the Crusader. Strong as an ox... and twice as smart. Presenting the Mage. Master of the arcane. Presenting the Scout! Ever cautious and deadly. Presenting the Sorcerer. Master of the undead. Presenting the Warrior! Bringing brawn to battle since the first era. House Dagoth Presenting Dagoth! The terrors of the lost House rise once more. House Hlaalu Presenting House Hlaalu! Always ready to hatch a plot. House Redoran Presenting House Redoran. The martial masters of Morrowind! House Telvanni Presenting Telvanni. The House of sorcery and deceit. Tribunal Temple Presenting the Tribunal! Powered by Morrowind's very gods. We have another brave warrior awaiting a challenge. The challenger is ready for another battle. Ladies and gentleman, we have a challenger! Any rank Let the games begin! These warriors want nothing more than to please you... with blood! Are... you... ready for a bloodbath? Two warriors enter, but only one can prevail. Who wants it more? Let's find out. Pit Dog rank Which of our Pit Dogs will prevail today? Let's find out, lower the gate! Brawler rank This match is a battle of the Brawlers. Let your voices be heard as these brave warriors fight for glory! Bloodletter rank There is nothing better than watching two eager Bloodletters fighting to the death for fame and glory! Myrmidon rank We've an exciting battle for you today citizens. Two Myrmidons fighting to the death! Warrior rank Today, two mighty Warriors will clash for you citizens. Lower the gates! Gladiator rank Witness as two skilled Gladiators battle for supremacy. Who... will... prevail?! Hero rank Can't anything stand before this Arena Hero? Let's find out. Champion rank Ladies and gentleman! Prepare for a battle of the Champions! Grand Champion rank Welcome back to the Arena. Your hero, the Graaand Champion! Won match Another step closer to ultimate glory. A challenger triumphs! What challenger waits next? What a triumph! This is a challenger to watch. An extraordinary performance! How far can this challenger go? Lost match A disappointing turn of events, citizens. Can the challenger come back? Our challenger has been humbled, but not defeated. That telling blow! But not the final one! A stunning battle! How will our challenger respond? 3 losses Challenger, receive your reward. Defeated final opponent The final foe has fallen! Well done challenger. The foe has been slain. We have a champion! with no losses Ladies aaand gentleman! We have... our... latest... legend of the Arena! Player resigned This challenger... is throwing in the towel. Brawler rank Our combatant has risen to the rank of Brawler! Now the real challenge begins. Bloodletter rank This Brawler is now a Bloodletter! Myrmidon rank Citizens, welcome this challenger to the rank of Myrmidon! Warrior rank Ladies and gentleman. We have a new Warrior! Gladiator rank There is a new Gladiator in the Arena! Hero rank People of Cyrodiil, you have a new Hero! Champion rank By Shinji, we have a new Champion. All hail the new Champion! Grand Champion rank Ladies and gentleman. Behold! At long last, the Imperial Arena's new... Grand... Champion! Cyrodiil! Show your love for one who has fought and bled for you! A dramatic finish deserves to be rewarded. What... a... performance! This is a true champion. This page was last modified on 3 November 2018, at 07:04.